Order full Mountaintop Grenade Launcher and receive a free Recluse Submachine Gun. Order Destiny 2 most popular Mountaintop Grenade Launcher and receive The Recluse Submachine Gun for free. Both weapons are some of the most sought after weapons in the game. 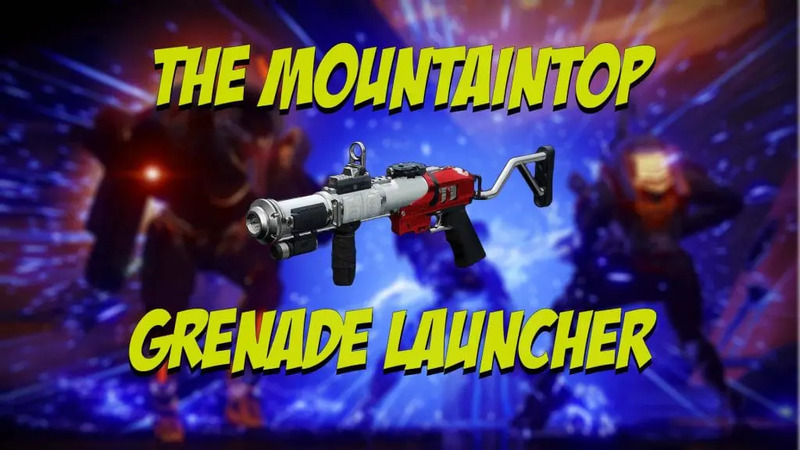 The Mountaintop is a new pinnacle weapon that was released with season 5. This Lightweight Grenade Launcher is acquired after completing a questline in Crucible given by Lord Shaxx and comes with a unique perk called “Micro-Missile”. The Mountaintop`s projectile instantly detonates on the environment instead of bouncing like a traditional grenade launcher, unless you have Sticky Grenades selected. It is the only Lightweight Grenade Launcher with the Sticky Grenades perk option. For Destiny 2 Season 5, Bungie has introduced The Mountaintop grenade launcher as the Crucible pinnacle weapon. A kinetic grenade launcher, The Mountaintop deviates from the mold by offering a projectile that fires in a straight line, almost like a missile. Pinnacle Season 5 weapons, The Mountaintop can do serious damage in the right hands. Reach Glory rank “Brave” within a season. Complete objectives in the Crucible. The objectives are as follows:– In the Crucible, earn Grenade Launcher final blows. – Rapidly defeat groups of two or more opponents. – Earn Calculated Trajectory medals. Reach Glory rank “Fabled” within a season. The first step in The Mountaintop Grenade Launcher quest is to hit Brave rank in the competitive playlist. This requires 200 points worth of Glory and should serve as an introduction to the playlist. From here, the quest step becomes more complex and it doesn’t require sticking to the competitive playlist. Players need to get 750 points worth of Grenade Launcher final blows, 200 points worth of double plays, and 100 points worth of Calculated Trajectory medals (three grenade launcher kills in a single life). For each of these quest steps, the point values are greater if the feat is completed in the competitive playlist. The final step in The Mountaintop grenade launcher quest is the reach Fabled rank in the Competitive playlist. This step should be familiar to most Destiny 2 players, as it is the true barrier to obtaining the Crucible pinnacle weapons. It will take some time, but players will need to reach 2100 Glory to hit Fabled rank. Once that is done, players can return to Lord Shaxx and claim The Mountaintop grenade launcher. We will complete for all available platforms including PlayStation (ps4), Xbox, or PC. The Recluse Legendary Pinnacle Submachine Gun is for Destiny Crucible players. It’s a Void Burn and fast firing. A kill with any weapon will improve its damage for a short time. Crucible pinnacle weapons are usually the hardest to get and involve reaching the rank of Fabled in the competitive playlist. For most players that is not an easy task with the way, Bungie has made the Valor Crucible Playlist. The Valor Crucible Playlist has gotten much harder now. The Recluse’s unique perk is “Master of Arms: Kills with any weapon improve this weapon’s damage for a short time.” Submachine Guns are in a contentious spot in the game after the Forsaken release. With Shotguns occupying a similar engagement range while also offering that one-shot-kill potential. That weapon spot is so highly valued, alongside always being in competition with Sidearms and even the Last Word as the close-quarters primary weapon of choice, Submachine Guns have fallen slightly to the wayside. So Bungie created the “Master of Arms” perk so it could find its place in any given loadout.